Rice noodles, made with rice flour, are popular in Southeast Asian cooking. Rice noodles find use as a replacement for regular pasta as well. You may find these thin, white noodles in your local grocery store as a dried product, although they are available freshly made in some specialty Asian markets. Rice noodles offer some nutritional value. 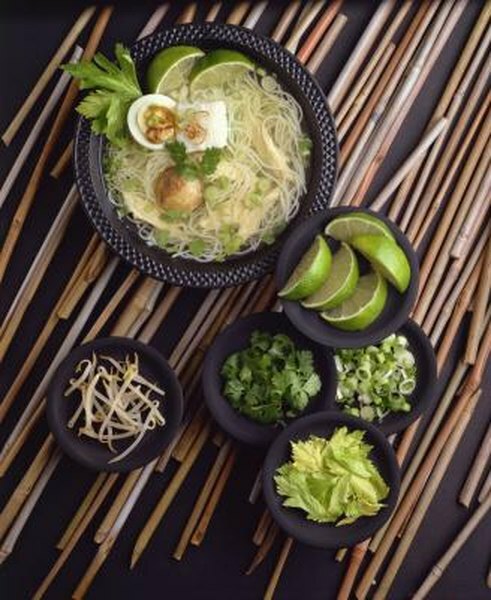 A 1-cup serving of cooked rice noodles contains 192 calories, according to MyFitnessPal. Based on a 2,000-calorie meal plan, this accounts for 9.6 percent of the calories you may include in your daily diet. Rice noodles contain no fat. This amount may vary, because rice noodles are not usually eaten alone -- be sure to include the calories or fat in any sauces, meats or vegetables you consume with rice noodles. Rice noodles do not contain significant amounts of protein -- 2 grams per 1-cup serving of cooked noodles. The Institute of Medicine recommends including 46 to 56 grams of protein in your daily meal plan. Your body requires protein to manufacture hormones and enzymes, maintain your immune system and repair tissues. It also serves as an energy source for your body. Adding meat such as turkey, beef or seafood to rice noodles boosts the protein content. Carbohydrates serve as the primary fuel for your body, and rice noodles provide you with a considerable amount. Each 1-cup serving contains 44 grams of carbohydrates, or 33.8 percent of the 130 grams recommended for daily consumption by the Institute of Medicine. In addition to the role carbohydrates play in satisfying your energy needs, the carbohydrates in rice noodles are critical for waste elimination and the health of your digestive system. Rice noodles are not nutrient-dense in terms of mineral content. A 1-cup serving of cooked rice noodles contains 1 percent of the daily recommended intake of both calcium and iron. Your body requires 1,000 to 1,300 milligrams of calcium each day to keep your bones and teeth healthy, as well as to prevent osteoporosis, a condition that causes brittle and easily fractured bones, later on in life. The iron in your diet helps you make blood cells that deliver oxygen throughout your body. Replacing regular pasta with rice noodles does not offer benefits in terms of calories and fat, and rice noodles have considerably less protein and minerals. A 1-cup serving of regular pasta contains 12 grams of protein and 20 percent of the recommended daily intake of iron. The only area in which rice noodles provide better nutrition is carbohydrates. If you follow a low-carbohydrate diet or need to reduce the amount of carbohydrates in your meal plan, rice noodles are the better choice. A 1-cup serving of regular pasta contains 63 grams of carbohydrates, compared to the 44 grams in 1 cup of rice noodles.